(Bloomberg Opinion) -- With Mario Draghi halfway out of the door, the battle is on for the future direction of European Central Bank monetary policy. The nature of the contest is arcane, to say the least. For a while now, the Banque de France governor Francois Villeroy de Galhau has been pushing the idea of “tiering” deposit rates to ease the pain that’s been inflicted on commercial banks by negative interest rates. At the moment, euro zone lenders are essentially having to pay to park their excess deposits with their central banks, putting a squeeze on profits. Tiering would exempt some of those excess reserves from the lowest rate, thereby lowering the cost to the banks. This week, Draghi himself conceded that the ECB needed to “reflect on” ways to mitigate any adverse affects of negative rates. Still, the debate is far from over. Klaas Knot, the Dutch central bank chief, on Thursday poured cold water on tiering. Peter Praet, the ECB’s outgoing chief economist, said there needed to be a solid monetary policy case for making such a change. How the ECB must regret stopping its bond-buying programs in December, just as the euro area’s economy stalled. That an old and complicated idea like tiering is being dusted off again shows the bank is in danger of running out of real policy options. Rather it is reduced to possibly tinkering around the edges. Messing around at the margins of deposit rates would solve little and would only benefit the stronger banks with the most excess reserves. It’s not as if this will do much for the commercial banks anyway. The potential savings may amount to just 7.3 billion euros (or about 6 percent of euro-area bank profits). 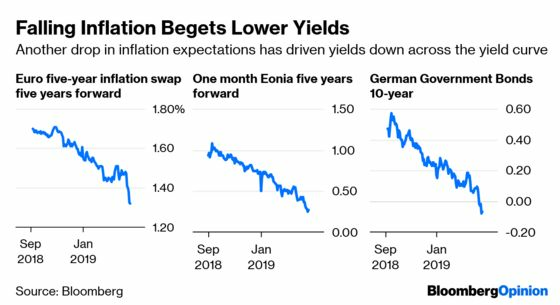 Is this really worth it, when you consider that tiering has been shunned before in case it signals to the wider economy that the ECB is hiking rates? If tiering was worth doing, it should have been done before rates were cut to negative – not as an afterthought now the economy is struggling again. Indeed, this desperate scraping of the policy barrel is merely making people think that the lower level on negative rates will be here for a long while yet – and might even be cut further. That’s why bond yields continue to fall: The market smells panic. Knot would, understandably, prefer to keep the focus on the provision of super-cheap funding to the banks, which has the added advantage of helping the weakest banks most. The next round of so-called “targeted longer-term refinancing operations” (TLTROs) – which do exactly that – is planned for September. Details on how this will be done will be released by June. It does seem as if bigger changes are afoot. Praet said in an interview with Bloomberg TV, that “if the scenario gets worse than what we expect, we must be ready to activate the tools – new tools also.” He stressed that the TLTRO terms could change and become a much broader stimulus program if needed. That’s a much less cautious tone than the last ECB policy meeting, when the new batch of TLTROs was announced. The ECB needs to do a far better job of communicating what can replace QE. The proliferation of competing views around tiering is just the latest thing to confuse the market. Draghi’s replacement needs to be named quickly.